IceCast and ShoutCast HTML5 Radio Player jQuery Plugins Bundle contains 3 Radio Player jQuery Plugins with ShoutCast & IceCast support. Want a radio player with history? Take a look at Hero Radio Player. Need a full width radio player with playlist categories and search? Sticky Radio Player jQuery Plugin – Full Width IceCast and ShoutCast HTML5 Radio Player is included in our bundle. Also do not forget Radio Player Shoutcast & Icecast jQuery Plugin – just add the radio stream and the player will get radio name, radio categories, current playing song and artist photo. Radio Player jQuery plugin, with playlist, categories and search, supports Shoutcast and Icecast radio streaming. The player uses Last.FM API to display the photo of the current playing singer. 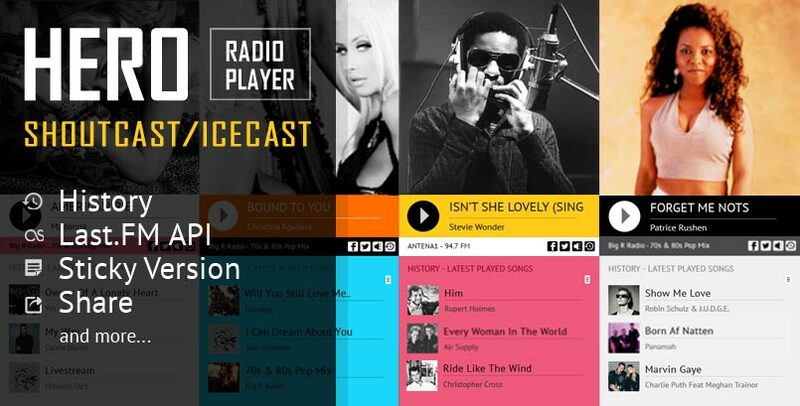 Sticky Radio Player jQuery Plugin supports Shoutcast and Icecast radio streaming. The player uses Last.FM API to display the photo of the current playing singer. In addition you have over 70 parameters from where you can customize your player. Therefore it includes: autoplay, initial volume, playlist, categories and color parameters.